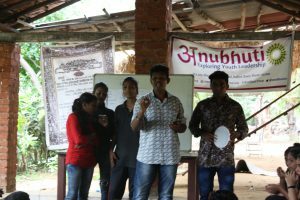 70 youth from Kolegaon and Bamanwada came together on the 2nd and 3rd June 2018 for a training to build their capacities to bring positive social change in their areas. The camp was held in Neral and both the groups had time to get to know each other on the bus ride though a few friendly games and songs. After a quick breakfast, Deepa Pawar led the first activity on the individual values of the group. Each member came up and wrote their values such as equality, straightforwardness, non- discrimination and so on. It became clear, once all these values were put up in front of the group, that all these values already existed in our constitution. This provided the perfect segue into the next session. The next session was conducted by Adv. Darshan Ingole on “Youth Responsibility from a legal Perspective” where he touched upon social, political and legal issues and ideas related to youth, both nationally and internationally. Darshan asked the group: “What is our responsibility as youth, and what is the constitutional process of our actions?” He also touched upon the issue of media, especially social media. After lunch the g roup was divided into two groups, and played a few competitive games. One game was to make a member of each team pass over a rope without touching it, and the other was to pass bottles to each other faster than the other team. Both games had a deeper lesson behind them- of keeping values strong and objectives clear. 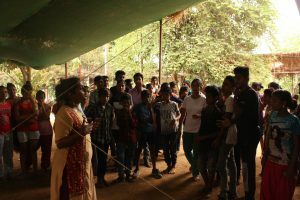 The games also served as a great group bonding activity for the group as a whole, having boys and girls from Kolegaon and Bamanwada working together. In the evening a film screening was arranged of the film “Tumhari Sulu”. The movie explores gender and gender roles in the home and in the workplace. However due to an unexpected power outage the film was cut short. Instead the group gained the opportunity to sit and talk with each other. Some played some games, whereas others spoke about the issues of their communities and the need for youth to work together. It was a beautiful sight seeing everyone sitting mostly in darkness but for a few lights emitting from torches, some laughing whereas some in deep political discussions. The next morning, fuelled by the discussions of the previous night a few youth took initiative and lead a session on the need for youth leadership and for social change. They talked about youth responsibility towards social justice, to make sure everyone has access to their rights and freedoms. After this session, the group was divided into smaller groups and asked to make lists of their personal priorities- of things that were important in their lives. From there they had to choose their group priorities. Groups then sha red their personal and group priorities with each other. By this activity it became clear to them how individualistic their goals and priorities were, completely contradicting the values they had laid out for themselves before. “When we wrote down our own personal priorities, we didn’t think about the group. When choosing the group priorities we saw that our personal priorities did not match.”, Said Amol from Kolegaon. 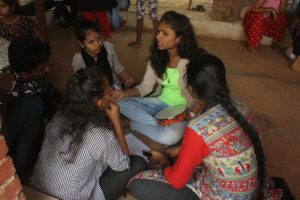 The next session was an activity based on labeling and how we as a part of society assume and judge those who do not fit into the boundaries of caste patriarchy. This was an incredibly emotional session exploring empathy and our own responsibility in perpetuating these labels and discrimination. One by one the youth shared experiences of when they had judged people based on sexuality, class, gender and so on. It was an open and honest discussion of our own biases in society. For the last session of the camp, the groups were divided according to their areas. Each group- divided into three- made a 3 month plan for their youth group. The plans included workshops for self development, youth based interventions in their community and how to sustain a larger network with the other youth group. Each sub group then presented their plan to the whole group. It was great to see each group learn and find ways to be inspired and motivated by each other. The camp ended with a feedback session where the youth spoke about what they will take back with them. Let us ensure Education for All!